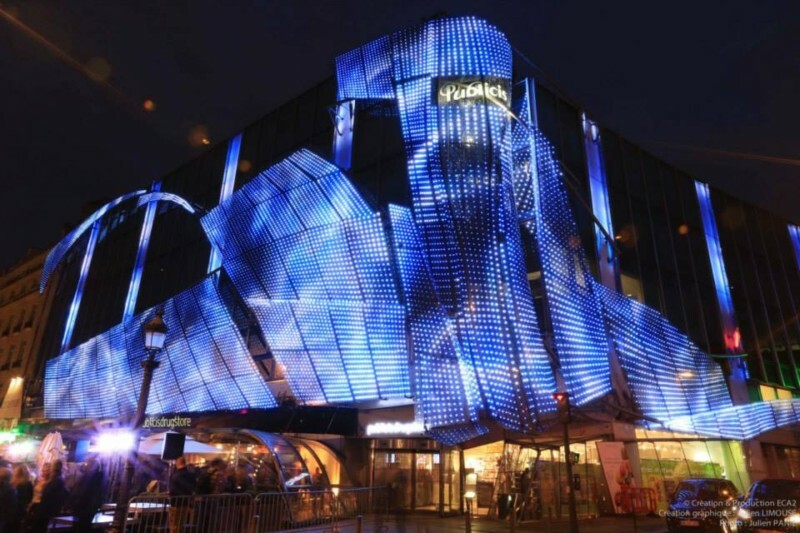 Paris, France — On July 7, 2014, the Publicis Group unveild the new illumination of its Group headquarters façade at 133 Avenue des Champs Elysées, a first for both employees and the general public. This illumination uses unprecedented and remarkable technological prowess and happens at every sunset. 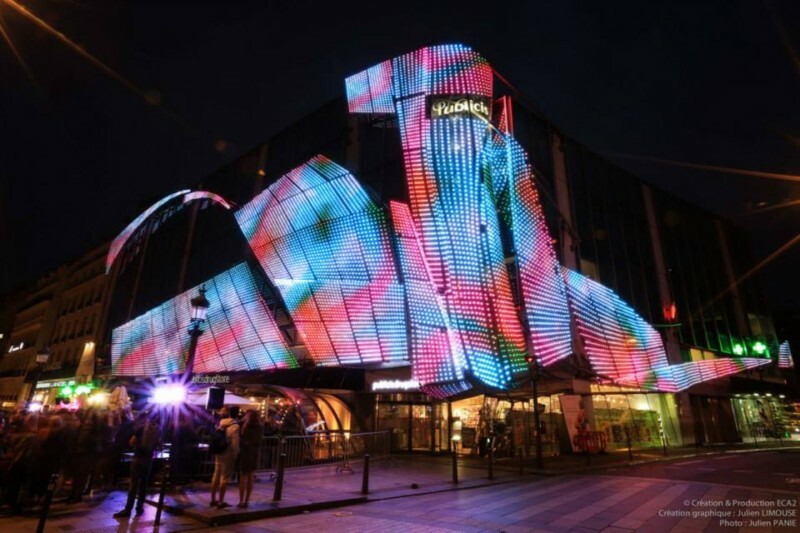 Built around a spiral 22 metres high, the 800m² of glass facade on the Publicis building is now lit by 17,000 LEDs akin to the pixels of a high definition screen. A complex and perfectly formed grid draws shapes by abstract or figurative movements. The show will be constantly updated throughout the year depending on what’s happening and the imagination of its creators. Following a trip to the United States, Marcel Bleustein-Blanchet, founder of the Publicis advertising agency, set up his offices in the former location of the Astoria hotel built in 1900 at the top of the Champs Elysées. In 1958 he opened the first European drugstore on the ground floor, the Publicis Drugstore – a bar, restaurant, cinema, shop, newsstand, tobacco shop and pharmacy open “all night” (until 2 in the morning). It revolutionised Parisian life. The Drugstore Publicis headquarters was totally destroyed by fire in 1972. Marcel Bleustein-Blanchet entrusted the architect, Pierre Dufau, a leading practitioner and visionary in office building architecture, with the reconstruction of the building. He created a simple building, with no grand architectural gestures; it has impressive hanging gardens and mirrored glass reflecting the Arc de Triomphe. In 1999, Elisabeth Badinter and Maurice Lévy wanted the Publicis Drugstore to mark the change into a new millenium. Their wish was to make the building even more symbolic than it already was. In 2004, the Californian architect of Italian origin, Michele Saee, transformed the drugstore in collaboration with ECA2, an agency within the Group, by installing 153 curved glass screens on the old facade. These seem to fit in with the dynamics of its position on the Champs Elysées near the Arc de Triomphe, while allowing the building to sit at the end of the avenue. In 2014, Maurice Lévy called again upon the technological and imaginative resources of ECA2. The aim was to make the building the new spectacular night time place-to-be on the world’s most beautiful avenue. 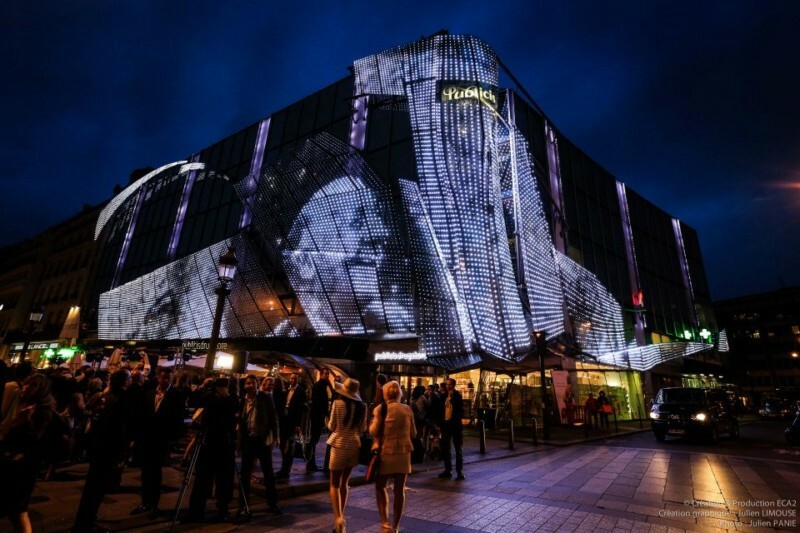 Publicis is offering a new light and digital attractionon the Champs Élysées a timeless symbol of elegance and the French exception, right in the vibrant upmarket heart of Paris. 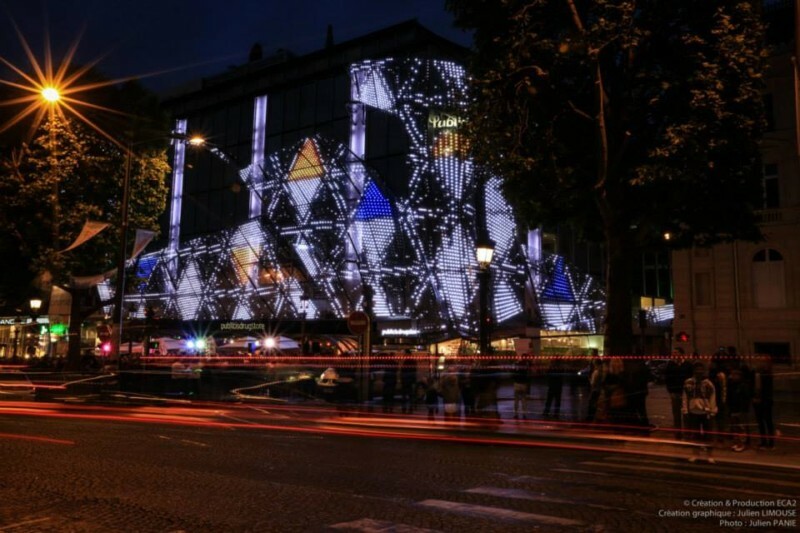 By dressing the building in a remarkable covering of lights across a surface of 800m², Publicis and its legendary Publicis Drugstore will highlight the global influence of a French company on the world’s most beautiful avenue. The project was extremely challenging…installing a technological structure on an already complex architectural piece. 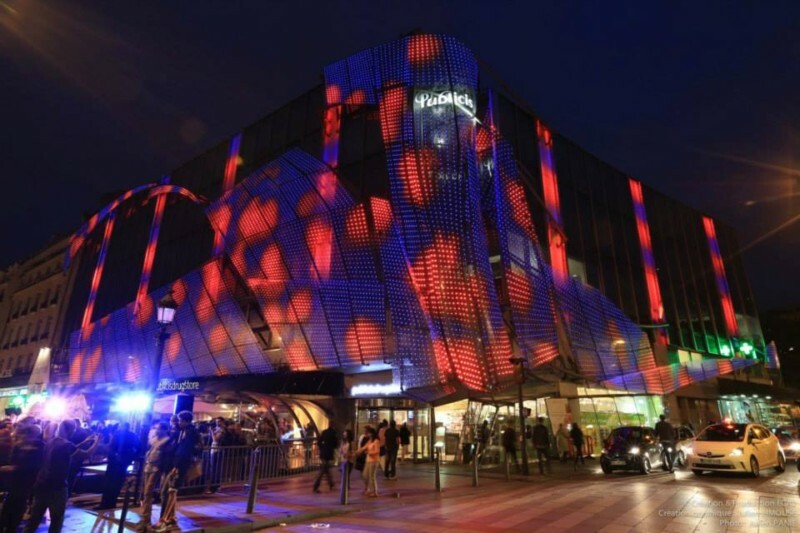 20 rope access technicians were involved in order to position the 17,000 LEDs from the top of the building onto an area nearly 800 metres squared. The absolutely perfect grid pattern of the LEDs produces an unusual finish. To interpret each convex curve of the 153 glass sheets, ECA2 had to design a unique prototype, the only one of its kind in the world. Strict constraints meant it had to respect the spirit of the existing structure, the identity of the Champs Elysées and nearby Arc de Triomphe, not to mention the peace and quiet of the employees behind the windows of the building. In addition, compliance with an environmental charter is another tour de force of the project with very low energy consumption: each pixel only consumes 1 watt per hour, which at full capacity is 17 kilowatts for the entire building. The ECA2 team who dreamed up the whole of this installation is the same team who created and orchestrated the Eiffel Tower millennium show.